Flo Brill in action for Cambridgeshire. Werrington Joggers claimed the local bragging rights when finishing fourth in Sunday’s Frostbite League finale at a waterlogged Hinchingbrooke Country Park. The city club were determined to hang onto their third place in the overall standings, and expecting a challenge from Nene Valley Harriers, they put out perhaps their strongest team of the season. Megan Ellison running for Lincolnshire. The challenge from Harriers failed to materialise though and Werrington were able to celebrate their best season for some years. Michael Taylor of Riverside Runners crossed the line first covering the boggy 5.5 mile course in 31:32, just two seconds ahead of rapidly improving Ben Heron from Eye Community Runners. 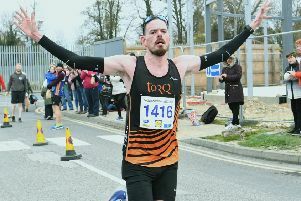 Paul Halford was the first Werrington Jogger home, taking third position and receiving fine support from Jeff Lucas (24th) and Martin Stevens (26th). Lee Harthill ran strongly for Nene Valley finishing 21st, two places ahead of Yaxley’s Mike Morley. Lisa Marriott of Ramsey Road Runners was first lady, with Eye’s Sarah Overington finishing fourth. The junior race was won at a canter by Joey Croft of Huntingdon AC with Isaac Ellard of Eye the first local home in fifth place. Shannon Flockhart of Hunts AC and PACTRAC’s Flo Brill battled it out to be head girl with Flockhart just coming out on top, defeating Brill by just one second. Nene Valley’s Amber Park was third. Nene Valley were third team on the day. A position that they echoed in the overall standings behind Riverside Runners and Hunts AC. Several of Nene Valley Harriers finest cross-country runners were in action at the season’s big finale, the Inter-Counties Championship at Cofton Park in Birmingham on Saturday. The Lincolnshire Under 20 men’s team finished sixth out of the 24 competing counties thanks to a trio of young Harriers. James McCrae led the county home in 20th place, with Alex Hampson not far behind in 29th.The third scorer was Daniel Skinner, from the Lincoln Wellington club, in 55th position while Bradley Spurdens of Nene Valley closed the scoring team finishing 64th. Michael Cawood finished 152nd, while Amittai Ben-Israel from PAC finished 87th in a Cambridgeshire vest. The highest individual position of the day by a local runner went to Flo Brill. She was 15th for Cambridgeshire in the Under 13 girls race. Ella Robinson came home in 160th position for Cambridgeshire and Sam Oakley was 235th in the boys Under 13 race in a light blue vest. Amber Park squeezed into the top 100 of the Under 15 girls race finishing 91st for Cambridgeshire with team-mates Josie Fortune and Ellie Piccaver finishing 220th and 223rd respectively. The Ellison siblings were picked to run for Lincolnshire and Ethan was placed 219th in the Under 15 boys race, and his older sister Megan finished 124th Under 17 girl. Although Cat Foley-Wray and Grace Mullins were selected for Lincolnshire they were unable to race on the day, leaving Ruth Jones to carry the Nene Valley mantle in the senior ladies race. She finished 202nd. Peterborough AC’s Steve Robinson ran well for Cambridgeshire in the senior men’s race finishing 48th. Peterborough Athletic Club’s Ellie Forrest competed in the English National Under 17 Indoor Combined Events Championships in Sheffield and was 21st out of 42 in the Under 17 age group. Her results were: 60m hurdles - 9.85; High Jump - 1.48m (PB); Shot - 10.89m (PB and club record); Long Jump - 4.44m; 800m - 2.52.65; Total score 2,776pts (PB). Andrea Jenkins was in fantastic form for Nene Valley Harriers at the British Masters Indoor Championships at Lee Valley. She won three titles - two with new championship best distances. Andrea Jenkins (Over 40): Hammer -1st 46.62m (CBP); Discus - 1st 36.33m; Weight - 1st 14.17m (CBP). Julian Smith (Over 45): 60m - 4th 7.64 (7.57 PB in heat); 200m - 2nd 24.72 (PB). Dave Brown (Over 35): 200m - 5th 23.82. Simon Achurch (Over 40): Hammer - 1st 41.09m; Weight - 1st 11.35m; Shot - 3rd - 11.35m. Tim Needham (Over 60): Discus - 4th 32.38m.